DENVER — Its been almost fifty years since President Richard Nixon declared a war on drugs. 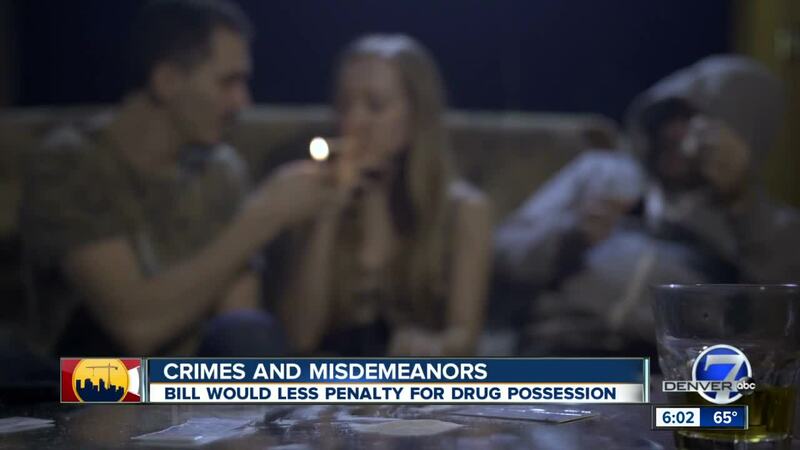 "The war on drugs has completely failed," said Rep. Leslie Herod, D-Denver. "The system is broken, and this is a way to fix it." Herod is sponsoring HB19-1263 , which would make drug possession a misdemeanor instead of a felony for all Schedule I and Schedule II substances, including heroin, fentanyl and cocaine. "You don't have that felony hanging over your head, and you can't get a job, and you can't get housing and you lose hope," explained Herod. The whole idea is to keep those struggling with addiction out of prison in favor of treatment. "Most importantly this bill doesn't eliminate the opportunity for a judge to sentence jail time," said Herod. "We're not saying it's no longer a crime; we're not saying that simple possession is something you're going to get a slap on the wrist for — 180 days is still 180 days in jail." Supporters believe the bill is an effective way to stop "arresting away" the growing drug problem and save taxpayer money. A report from the Joint Budget Committee found savings anywhere from $8.6 million to $13.7 million over the next five years. The bill has bi-partisan support, but critics argue it's a dangerous idea that already isn't working in other states like Washington. "They've experienced explosive growth in the homeless population, and they blame it on exactly this moment in time," El Paso County Sheriff Bill Elder said during a House committee hearing on the bill. "Violent criminal activity has increased dramatically in Seattle in the year since making Schedule I and II drugs misdemeanors." Elder urged lawmakers to vote no on the bill and called it a slippery slope. "I urge you to head the warnings from other communities. I agree with many in my line of work who see what you're about to do as a slap in the face to every single one of us," said Elder. Other concerns raised by opponents involve the increased cost to local communities since those charged with drug possession would no longer go to state prison and instead be housed in county jails. Many of which are already overcrowded or at capacity. The bill passed the House Judiciary Committee and now heads to the Finance Committee.